Answer: Opening Day, including the first games, is typically the last Saturday in March. Closing ceremonies are typically held the first Saturday in June. Softball and Tball end their regular season in mid-May. Baseball (American League, National League and Major League) close their regular season typically on the first Saturday in June. Junior and Senior baseball complete their regular season at the end of June. Consult the league calendar on the website for exacts dates for this season. Answer: Generally speaking, games are played Monday – Thursday evenings and on Saturday. Occasionally, weather cancelations or other interruptions in the schedule require us to play a game on Friday or Sunday. Week night games are played at 5:30 pm or 7:30 pm. Younger age groups rarely, if ever play in late games. Games are played throughout the day on Saturday. Answer: T-Ball and Baseball (American League, National League and Major League) practices typically start the first weekend in March, depending on the year. Junior and Senior baseball starts mid-April. Check the league calendar for the exact dates for this season. Question: How many games and practices can I expect per week? Coaches need to also pay attention to the additional guidelines in the next question regarding the maximum times they may get together each week. Question: I need to request a change in the schedule, (game or practice), how do I do that? Answer: Coaches have the ability to add/edit practices on the league website. Coaches are not allowed to reschedule games. Coaches must first login to the website and navigate to the Master Schedule and click "Add Event". Keep in mind that MPTLL limits teams to a maximum of 4 practices per week during the preseason. Once games start a maximum of 2 games and 2 practices per week are allowed. Any team gathering at our fields or at an offsite batting facility to work on baseball skills/knowledge is considered to be holding a practice. There is such a thing as too much baseball/softball and we feel that 4 days at the fields per week (which means 5 days if you are a challenge player) is the maximum amount for the age groups we serve. Additionally field space is at a premium so we need to make sure that the teams within the different leagues are getting an equal share of our limited resources. Note a week is considered Monday to Sunday. This format follows the way the schedule is set up. Practices are defined as those events which take place at a facility and involve a single team. When scheduled, these events show up on the team's Schedule and can be used to capture RSVPs. Scheduled practices also have the ability to send out notifications automatically about changes and can also remind people about an upcoming event. To add or edit a practice on the website coaches must login and navigate to your team's schedule page as shown below. Click the options button in the top right corner and then click "Add New Event". Complete or change the practice details and then click submit to save. Question: How do I schedule a batting cage, soft toss net or bull pen? Do teams with practices at that time have priority, or does a team not practicing have priority? Answer: In general, the cages, soft toss nets and bull pens are available as first-come-first-serve. However an NL, ML, or Softball team warming up for a game has priority over a team practicing. AL and Coach Pitch teams do not get pre-game priority. A team whose field is closed because of weather has priority over a team who is using both their assigned field and the extra practice location. A team who has a scheduled practice at that time, and wants to use the cages, nets and bull pens, has priority over a team who has come early, stayed late, or is trying to get an extra day of practice outside of their scheduled time. Except for pre-game warm-ups on game days, Softball teams have priority for the Kiser-Chapman cage, and baseball teams have priority for the other cages. Please apply a reason standard to these areas. If a team is waiting, share. On game days – there are not enough cages for every team to warm up at the same time. Please review the guidelines below regarding the schedule for the cages on game days. Question: On game days are the cages first come first serve? Or is there some protocol the league follows that I need to know? Question: Do coaches have to attend tryouts? Answer: Technically no. However the League strongly recommends that you and/or your team’s other coaches attend. MPTLL drafts players in the AL, NL, ML and Jr leagues, and while League grades are made available to all coaches, there is nothing like first-hand knowledge. There is a huge difference between having a good draft and a bad draft. Question: How are teams selected? Answer: T-Ball teams are put together by the League coordinator. American League, National League, Major, and Junior teams are drafted by the coaches after tryouts are held. Question: When are the drafts held? Answer: Drafts are held several days after tryouts complete. American, National and Major League tryouts are typically held the last weekend in February. Junior League tryouts are in mid-April. Check the league calendar for the exact date for this season. Question: I have coached my son or daughter since T-Ball and now that they are 10, they might get drafted by a major league team. Are there opportunities to continue to coach my child if they are drafted? Answer: It depends. MPTLL is blessed to have long tenured coaches in the Major Leagues, and most of the teams have a core group of assistants that have helped out for many years. Some ML head coaches encourage parents to help out, and some prefer to avoid parents helping out at all. Bottom line, coaching your son or daughter in the ML depends on several factors including which team drafts your child, how many assistants are returning, etc. Question: When do I pick up equipment, and what is included? Answer: The League provides an equipment bag that contains batting helmets, a complete set of catcher’s gear, practice baseballs and game baseballs. The League also provides a scorebook and pitch counter. The gear is passed out several days before the 1st practice, which is typically around the 1st weekend in March. Your league coordinator will be in touch with specifics for this season. Question: When do we pick up uniforms and what is included? Answer: Uniforms are passed out the week before Opening day. For the exact date for this season, monitor the league calendar. The League provides hats, jerseys (typically t-shirts) and socks for Tball, American League and National League. Baseball pants are not provided. Players in these leagues are able to keep the hat, socks and jersey. Major League teams receive a full uniform, including pants. However players are required to turn in their uniforms at the end of the season. ML players can only keep the hat and socks. Question: What are the green mats for? Answer: Protective mats are used on GH2, Wade, Founders, KC, East, GH1, and the New Field on the mounds and in the batter’s boxes to reduce holes that are created from all of the practices and games. Using the mats saves our grounds crew countless hours over the course of a season. ALWAYS use the mats unless you are playing a game. Rule of thumb – if there are no umpires, use the mats. Also, coaches are asked to replace the mats after games if they are the last game of the day/night. Answer: The main method of announcing that the fields are closed is an email to all the coaches. Coaches then communicate to their parents. Coaches may decide to get together for a chalk session, or maybe try to go indoors, or in some cases to use the batting cages at the fields. In situations where we are dealing with heavy rain or severe weather, a notice will be posted in the Announcement Section of the League website – www.mptll.org and a league wide email will be sent out. We try to balance waiting as long as possible to give us the best chance of playing or practicing vs. providing ample time for the word to get out if we do close the fields. In general, this call is made between 2pm – 3pm. Note that if the league closes the fields, it means that the fields are completely closed. No team is allowed on the fields. Sometimes it is possible that 1 or more fields remain open when the others are closed. Teams scheduled for the fields are that playable keep their game/practice slot. It is the luck of the draw. Question: Can I email my team and parents from the website? Answer: Yes, emailing your team is easy. First you need to login to the website and navigate to your team page. As a coach, manager, or contact, you have the rights to email your team from the Roster page on your site. Once logged in, go to your team's Roster page as shown in the screen shot below. 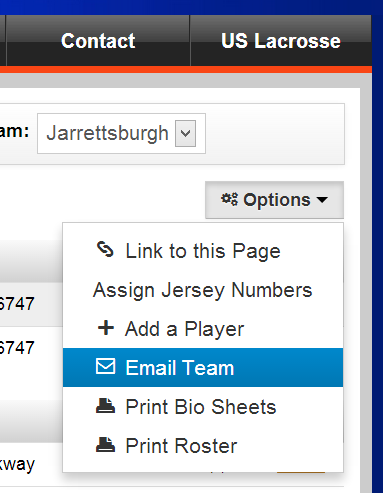 Once on the roster page, locate the options button in the top right corner, and select Email Team. Compose your email and click Send once you are done. 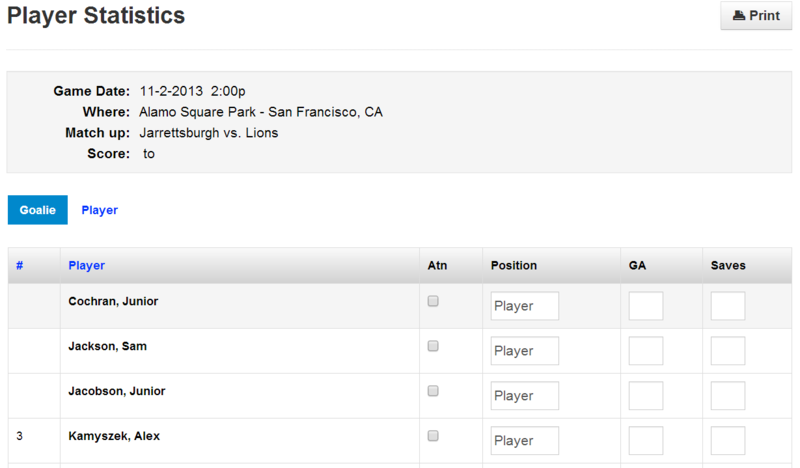 Question: The team I coach is listed as the home team; what do I need to make sure I do before the game? Make sure you provide new game balls to the umpire. Three balls are the norm for ML and NL games while two new balls will suffice for AL games. Lining the field - use chalk on the dirt areas and use paint on the grass areas. Removing the green mats from the batters box and pitching mound area. Turning on the scoreboard and setting it up before the game (On/Off switch is on the back of the scoreboard). Scoreboard controllers are located in the first storage bin (closest to the main parking lot) in black briefcases. Each briefcase is labeled with an associated field name. For NL and ML weeknight games it is not necessary to line the field or paint the bases if your game is a second game starting at 7:30 pm. On Saturdays, the home team of the third game of the day for each field should rake/drag the field again, should add more chalk, and assess if the bases need to be repainted. Equipment for field prep work is in the locked containers. When you remove equipment from the container, always close the door and lock the lock. It is your responsibility to replace the mats before you leave the field, unless you’re certain that a game follows yours on that same field. In addition it is your responsibility to replace the mats if you have the last practice of the day/night. If you are playing the last game of the day (weeknight or Saturday) then it is your responsibility to turn off the scoreboard (On/Off switch is on the back of the scoreboard) and also return the scoreboard control unit to the first storage bin (closest to the main parking lot). Note – if the fields are wet from rain, plan ahead since extra time may be required to get the field ready, and you may need to recruit help from team parents. Question: I just completed a game and I need to enter the results into the league database. How do I enter the information? Answer: After games are completed coaches are required to enter “Game Results” on the website. To enter the results coaches need to login to the website and navigate to their team page. Here are the steps in the process. Navigate to http://www.mptll.org and click “Sign In” at the top right hand side of the webpage. To login, coaches should enter their username (email address) and password. If they do not know their password they can click “Forgot Password” and they will receive instructions to reset their password. Once logged in, navigate to your team page (all teams are listed under the “Team” tab at the top of every webpage on the site). 6. If an event does not have a score entered, click the first icon on the left under actions. 7. Enter in the result details, and submit to save. 8. Upon completion, hit the "Submit" button at the bottom of the page. Question: How do I enter pitch counts for my players that pitched during each game? Answer: Coaches are required to enter pitch counts after each game in the same manner that you updated "Game Results". Follow steps 1-5 in the previous FAQ. After completing those steps click the second icon (middle) under actions next to the game you want to update. Enter the total number of pitches thrown in the "PT" column and then select the "PC Met" checkbox if that particular player reached the pitch count threshold on their last batter. Leave the field unchecked if the pitch count milestone was not met on the pitchers last batter. After entering the pitch count information click the "Save" button and you are done. Note: The screen shot below is hockey related and will be different for baseball.